Triiodothyronine (T3) levels are obtained in suspected cases of hyperthyroidism, either because the patient has typical symptoms or when the thyroid-stimulation hormone (TSH) levels are lower than normal. The reference range of free triiodothyronine (FT3) in adults is 260-480 pg/dL, or 4-7.4 pmol/L. It is usually not measured in children. Increased free T3 values are found in triiodothyronine toxicosis, hyperthyroidism, and peripheral resistance syndrome. Decreased free T3 values are found in primary and secondary hypothyroidism and in the third trimester of pregnancy. Elevated total triiodothyronine values are found in hyperthyroidism, triiodothyronine thyrotoxicosis, and acute thyroiditis. They are also increased in association with a daily dosage of 25 µg or more of triiodothyronine or 300 µg of thyroxine (T4) and elevation in the levels of thyroid-binding globulin. Reduced total triiodothyronine values are found in clinical or subclinical hypothyroidism, starvation, stress, and acute illness, as well as in the setting of reduced levels of thyroid-binding globulin. All laboratories may not be equipped to perform thyroid testing, and samples may be sent to a reference laboratory in such cases, where specialized equipment is available. In general, thyroid hormones are not measured in isolation. A thyroid panel consists of essentially the baseline fT3, fT4, and thyroid-stimulating hormone (TSH). For future review, only the TSH level is obtained, as it is the most sensitive indicator of thyroid status. In selected cases, total hormone levels, thyrotropin-releasing hormone (TRH) stimulation test, thyroglobulin levels, and thyroid antibodies may be advised. The chemical structure of triiodothyronine is C15 H12 I3 NO4. The thyroid is the only tissue that can oxidize iodide to a higher valence state that is essential for iodide organification and thyroid hormone biosynthesis. This is mediated by an enzyme called peroxidase (thyroperoxidase) and occurs at the luminal surface of the follicular cells of the thyroid gland. Thyroperoxidase, a tetrameric protein with a molecular weight of 60 kDa, requires hydrogen peroxide (H2 O2) as an oxidizing agent. The H2 O2 is produced by a nicotinamide adenine dinucleotide phosphate (NADPH)–dependent enzyme resembling cytochrome-c reductase. Antithyroid drugs such as the thiourea group inhibit iodide oxidation and therefore its subsequent incorporation into monoiodotyrosine (MIT) and diiodotyrosine (DIT). Once iodination occurs, the iodine does not readily leave the thyroid. Free tyrosine can be iodinated but is not incorporated into proteins since tRNA does not recognize iodinated tyrosine. The coupling of two DIT molecules to form T4 or of one DIT and one MIT to form T3 occurs within the thyroglobulin molecule. A separate coupling enzyme has not been found, and, since this is an oxidative process, it is believed to be mediated by the same thyroperoxidase by stimulation of free radical formation from iodotyrosine. Thyroid hormones thus formed are stored in the thyroglobulin until it is degraded and the hormones are released into the circulation. An enzyme called deiodinase removes iodide from the inactive monoiodothyronine and diiodothyronine molecules in the thyroid, which restores most of the iodide used in the biosynthesis of T4 and T3. From the thyroid hormones released into the bloodstream, a peripheral deiodinase in target tissues such as the pituitary, kidney, and liver selectively removes iodide from the 5’ position of T4 to make T3, which is a much more active molecule. Thus, like thyroglobulin, T4 may also be considered a prohormone, the difference being that T4 has some intrinsic activity, while T3 is actually used by the end organ, and almost all metabolic activity depends on the action of T3. The effect of T3 on target tissues is about 4 times more than T4. T3 is just 20% of the total thyroid hormones produced by the thyroid gland, while T4 is 80%. However, the concentration of T3 in the human blood plasma is about 1/40 that of T4. This is observed in fact because of the short half-life of T3, which is only 2.5 days, while the half-life of T4 is about 6.5 days. The thyroid hormones T3 (and T4) are transported in the circulation bound mainly to the protein carrier thyroid-binding protein thyroxine-binding globulin (TBG). Other binding proteins such as thyroxine-binding prealbumins and albumins are also present. More than 99% of the T3 in the circulation is bound to TBG and several other minor proteins, while the remaining T3 exists as free hormone. In other words, the amount of free triiodothyronine is about 1/1000 that of total triiodothyronine. It is a measurement of the fraction of the circulatory T3 that exists in the free state in the blood, unbound to protein. It is important in evaluating the effectiveness of thyroid replacement therapy, in ruling out T3 thyrotoxicosis, and in detecting protein-binding abnormalities. In the peripheral tissues, the hormones bind to thyroid receptors in almost all the major organ systems in the body that are concerned with metabolism (eg, heart, brain, liver, muscle, skin). Being lipophilic, T3 (and T4) passes through the phospholipid bilayers of target cells. At the cellular level, T3 increases the basal metabolic rate by the production of the Na+/K+ -ATPase and, thus, increases the body's oxygen and energy consumption. T3 stimulates the production of RNA polymerase I and II and, therefore, increases the rate of protein synthesis, as well as its breakdown. Thus, when T3 levels are increased, the rate of protein breakdown exceeds the rate of synthesis, and weight is lost. It increases the rate of glycogen breakdown and glucose synthesis, resulting in gluconeogenesis. It also stimulates the breakdown of cholesterol and increases the number of low-density lipoprotein (LDL) receptors, thereby increasing the rate of lipolysis. In the target organs (eg, heart), T3 increases the heart rate and force of contraction, thus increasing cardiac output by increasing β-adrenergic receptor levels in myocardium. This results in increased systolic blood pressure and decreased diastolic blood pressure. T3 is essential for the development of the lungs and nervous system in the fetus and newborn and its growth through infancy and childhood. It is also important in the development of the musculoskeletal system. When the levels of thyroid hormones are deranged, the symptoms and signs of hyperthyroidism or hypothyroidism are apparent and may be reflected in the blood levels of these hormones, most specifically TSH, produced and secreted by the pituitary gland. In fact, TSH levels are generally measured as the first line of testing in determining thyroid status, whether normal (euthyroid), hyperfunctioning (hyperthyroid), or hypofunctioning (hypothyroid), because the production and release of thyroid hormones from the thyroid gland depends on the pituitary-hypothalamus axis, which functions on the principle of negative feedback. This means that, when normal amounts of thyroid hormones are present in the blood, TSH release is suppressed; it is elevated when hormone levels are low and depressed when hormone levels are high. TSH release is further controlled by thyrotropin-releasing hormone (TRH) secreted by the hypothalamus, again by negative feedback. Primary thyroid dysfunction (ie, hyperthyroidism or hypothyroidism) results from disease in the thyroid gland itself, caused by either deficiency or absence of processing enzymes or an autoimmune process attacking these enzymes or the cellular architecture of the gland. It also results from deficiency in the intake of thyroid hormones (eg, endemic goiter) or impaired uptake and processing of iodine due to drugs. Secondary hyperthyroidism or hypothyroidism results from disease and/or dysfunction of the pituitary or the hypothalamus, leading to abnormal stimulation of the thyroid gland. Goiter, or thyromegaly (ie, enlargement of the thyroid gland), may or may not occur with hyperthyroidism or hypothyroidism. The thyroid gland does not become smaller than normal. Hyperthyroidism may result from increased levels of both T3 and T4, T3 only (T3 toxicosis), or T4 only (T4 toxicosis). T3 toxicosis may be caused by a toxic nodule and is generally seen in elderly individuals. In these patients, a subnormal T4 level, if measured in isolation, may give a mistaken impression of hypothyroidism. T4 toxicosis may result from increased iodine intake; in T3 or T4 toxicosis, the peripheral conversion of T4 to T3 is not affected. The symptoms and signs of hyperthyroidism include insomnia, weight loss, increased sweating, fatigue, loose motions, oligomenorrhea, tremors, palpitations, intolerance to heat and/or light, anxiety, tachycardia, eye changes, infertility, and osteoporosis. All or some of these features may be present in the same patient. In elderly persons, these changes may be missed owing to the effects of aging; this is termed “apathetic hyperthyroidism.” The symptoms and signs of hypothyroidism are the contrary of those mentioned above, as well as like myxedema, mucosal thickening causing hoarse voice, dry hair and hair loss, and psychomotor retardation. The most common method for the estimation of T3 is enzyme-linked immunosorbent assay (ELISA). The detailed description of the contents of the kit, instructions as to its use, and interpretation of results are outlined in the kit and are not mentioned in detail here. The human T3 ELISA kit, which uses a monoclonal anti-T3 and T3-horseradish peroxidase (HRP) conjugate, can be used to measure very low concentrations of T3 in small serum volumes (50 μL per assay). The buffer and sample are incubated together with anti-T3 antibody–coated plate for one hour and then washed. Afterward, the diluted T3-HRP conjugate is added to each well and incubated. After incubation is complete, the T3 ELISA kit’s wells are decanted and washed 3 times. Then, the wells are incubated with a substrate for the enzyme, the reaction of which results in a complex with a blue color. In the final step, the reaction is stopped upon addition of a stopping solution, and the color of the solution then changes to yellow. 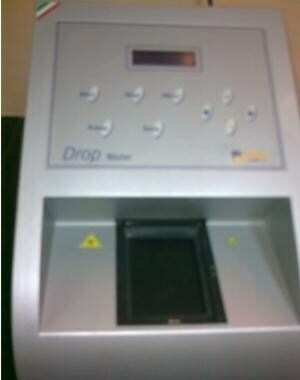 The image below depicts an ELISA washer. 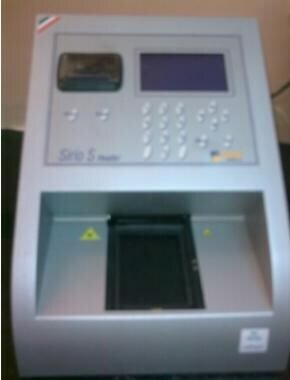 The color intensity is measured in a microplate reader with spectrophotometry at 450 nm (see image below). Because the T3 from the sample competes with the T3-HRP conjugate for the anti-T3 antibody–binding sites, the color intensity is inversely proportional to the concentration of T3. As the T3 from the sample occupies more sites, fewer sites are left to bind T3-HRP conjugate since the site number is limited. Standards of known T3 concentrations are processed simultaneously with the samples undergoing assay, and a standard curve that relates the color intensity (optical density) to T3 concentration is plotted. Each sample’s unknown T3 concentration is interpolated based on this curve. T3 levels are obtained in suspected cases of hyperthyroidism, either because the patient has typical symptoms or when the TSH levels are lower than normal. Mild or subclinical hyperthyroidism occurs when the TSH level is low but the T4 and T3 levels are normal. Obvious hyperthyroid signs and symptoms exist when the TSH is low and the T4 and T3 levels are high or at the higher end of normal. Normal or low T3 or T4 levels along with high TSH levels suggest mild or subclinical hypothyroidism and overt hypothyroidism, respectively, while normal to low T3 and T4 levels along with a low TSH level suggest nonthyroidal and pituitary or secondary hypothyroidism. Factors that interfere with the estimation of FT3 include recently administered radioisotopes, high altitude, and certain medications. Drugs that cause elevated or false-positive values include amiodarone, aspirin, carbamazepine, fenoprofen, phenytoin, ranitidine, thyroxine, and levothyroxine. Drugs that cause reduced or false-negative values include corticosteroids, methimazole, propranolol, somatostatin, and radiographic agents. In addition to the drugs that affect the estimation of free T3, medications such as estrogen, certain types of oral contraceptive pills, clofibrate, and opiates affect the estimation of total T3 (and total T4) by increasing the values because binding proteins are increased. Similarly, total T3 (and T4) levels are decreased by lithium, dopamine, salicylates, anticonvulsants, androgens, and corticosteroids. An altered hormonal status, as in pregnancy, increases total T3 levels in the absence of true hyperthyroidism. Therefore, the estimation of free T3, and not total T3, is a reliable parameter for evaluating thyroid status. When total hormone levels are measured, drugs known to interfere with the estimation must be discontinued for a week or more prior to testing. However, this is often undesirable; therefore, free hormone levels are generally ordered nowadays. The thyroid uptake test (T3 uptake), also known as T3 resin uptake (T3RU), is used to calculate the amount of thyroid hormone–binding proteins in the circulation based on the levels of T3 and T4 in the patient’s serum. However, this is not performed nowadays, as free hormone levels can be measured and are more useful in planning treatment. Reverse T3 (RT3 or REVT3) is a biologically inactive form of T3 that is formed in small quantities when T4 is converted to T3. In times of stress or severe acute or chronic illness, RT3 levels are elevated in the absence of hyperthyroidism. This is known as euthyroid sick syndrome. It is therefore not advisable to test for thyroid status in patients who are ill or who are in the hospital for other reasons. P Anthony Weil. The Diversity of the Endocrine System.Harper’s Illustrated Biochemistry. 28th Edn. 436-438. Frances Fischbach. A Manual of Laboratory Diagnostic Tests, Chemistry Studies-Thyroid Function Tests. 6th Edn. 482-498. Pagana KD, Pagana TJ. Mosby’s Diagnostic and Laboratory Test Reference. 8th Edn. 916-918. Pingitore A, Galli E, Barison A, Iervasi A, Scarlattini M, Nucci D. Acute effects of triiodothyronine (T3) replacement therapy in patients with chronic heart failure and low-T3 syndrome: a randomized, placebo-controlled study. J Clin Endocrinol Metab. 2008 Apr. 93(4):1351-8. [Medline].